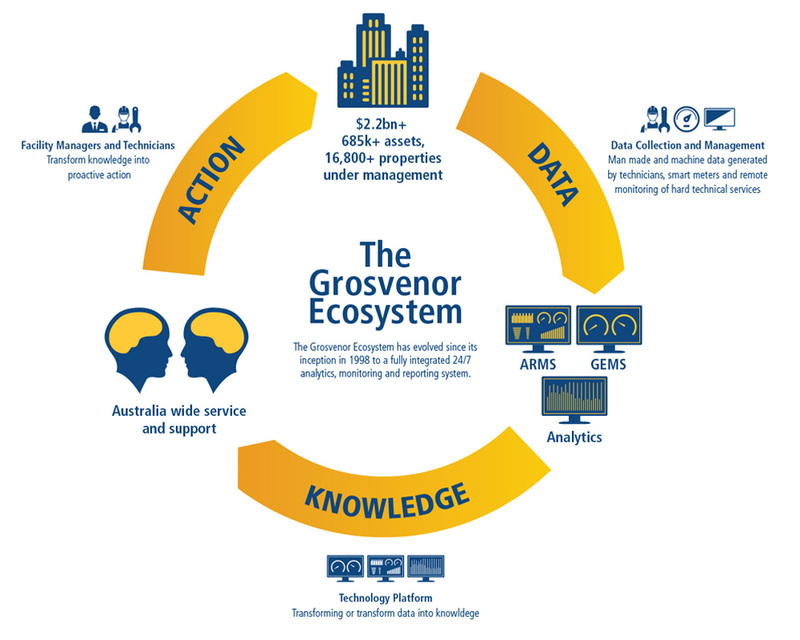 The Grosvenor Ecosystem is built on the foundation of the Data-Knowledge-Action methodology. With over 685,000 assets under management, Grosvenor has the most extensive asset management database in Australia. Together with Grosvenor technology, benchmarks from over 20 years of data are used to drive better whole-of-life performance outcomes. Grosvenor has developed a powerful asset maintenance and lifecycle management ecosystem. 1. ARMS (Asset & Resources Management System) is our custom built ERP. Man-made, Energy and Machine data generated by technicians, smart meters and remote monitoring of hard technical services is inputted into ARMS. This data is transformed into knowledge with an easy-to-understand dashboard (ARMSonWeb) for building owners and managers. Building owners can access historical data on the performance of their buildings and assets. This data is transformed to knowledge via the ARMS platform and our customised reporting. Building managers can prioritise their work on the worst performing assets and buildings. It also predicts future maintenance requirements so building managers can develop suitable workplans and prioritise critical works to ensure their buildings perform all-year-round. Reports can be accessed real-time via the online portable ARMSonWeb or emailed directly to the property manager. Quotes can be automatically created to streamline efficiency and minimise administration burdens – approval and progress can be tracked online. One of the key benefits is ARMSonWeb can work alongside your business’ existing ERP systems and processes. This saves time and energy by streamlining workflow and ensures that building managers gain better visibility over the current and future performance of their buildings. 2. GEMS (Grosvenor Energy Management System) is our energy management package. More and more clients are realising the value of benchmarking their building performance. GEMS is our energy management and reporting package, designed specifically to manage your building’s NABERS rating. GEMS sends daily, weekly, and monthly NABERS performance reports and is a seamless system that integrates into Grosvenor’s delivery of asset maintenance and lifecycle management services. The simple to read reports clearly identify the daily and yearly energy performance, temperature, hourly consumption, peak and base load energy, and power factor allowing you easy access to business critical performance information. 3. Grosvenor Analytics delivers fault detection and retro-commissioning solutions. Man-made and machine data can be transformed into knowledge using the Grosvenor Analytics platform. With over 20 years of data, Grosvenor is in a unique position of developing algorithms which more accurately predict the most likely equipment failure for every property. These complex algorithms monitor asset performance in real-time. Algorithms act like a virtual maintenance technician that works in the plant room 24/7, constantly looking and learning about the building’s systems to identify small issues before they become big problems. Both Virtual Technical and Virtual Engineer are key parts to the overall Grosvenor Ecosystem for asset management. Through the use of Grosvenor Analytics, this transforms technicians from reactive service providers to value-added specialists who can diagnose and fix issues faster and more accurately than the traditional method of visual inspection. Alarms signal the risk of potential equipment failure so the problem can be rectified before a critical failure occurs. This gives building owners and managers peace-of-mind in maximising all-year-round performance and operation of their assets and property portfolios. Virtual Engineer which determines if systems in the buildings are working to optimum efficiency and if individual assets are working against one another. Our clients consistently tell us our integrated approach to analytics “allow our Facility Managers to spend more time walking the floor and interacting with our tenants”.